Times Square. For those who’ve never been, it’s the most iconic image of New York: a bustling hotbed of never-sleepers, neon signs, yellow taxis, and lots and lots of advertising. 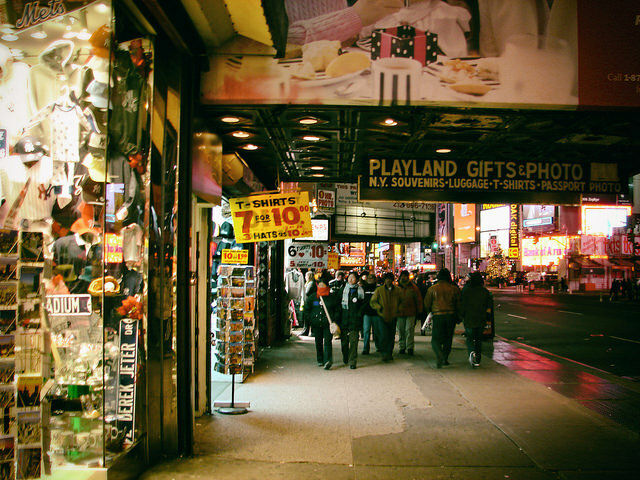 But for those who have ventured to the streets surrounding 42nd & Broadway, another reality is known: the Times Square that is more of a caricature of New York than a fair representation of it. Here is where suburban families can dine at familiar chains like Applebee’s and McDonald’s, purchase I heart NY shirts, and wave behind the glass of Good Morning America. Where else is advertising the main attraction but in Times Square? Gleaming tributes to branding at every turn. 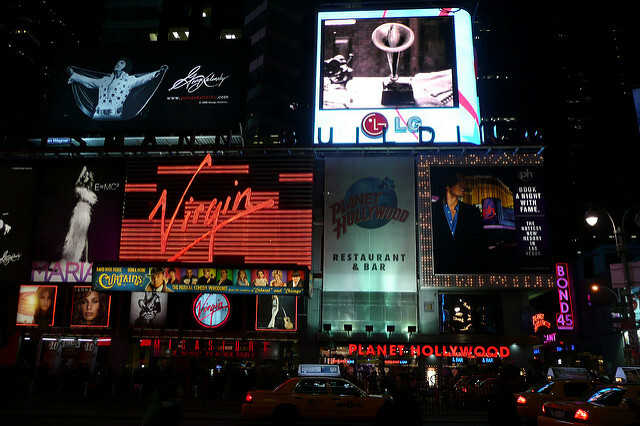 There are two great ways to incorporate the neon and signage for your event: replicate the advertisements verbatim, or adapt them to feature your own memories, products, or people. Remember, significant meaning always beats mere production value. And as always, be sure to create a corner of your decor that’s friendly to selfies. 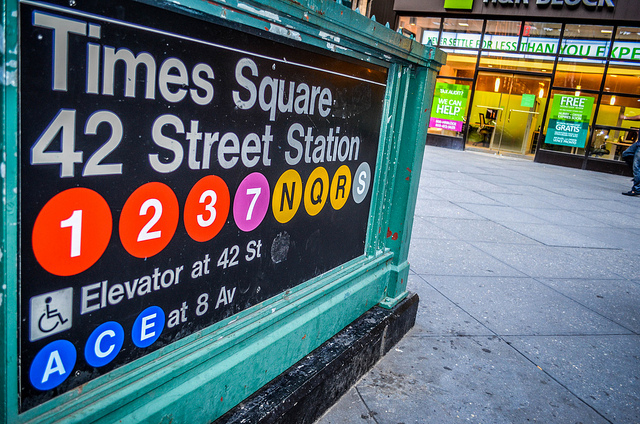 No, Times Square is not the locale for fine jewelry or designer clothing. For that, you’ll have the venture to Fifth Avenue. Here, knockoff watches, cheap statuettes, and “cashmere” scarves are sold by the dozen. Our take? If you have swag to give away, stock a “souvenir store” with the goods and give guests a token to redeem for their chotchkies. 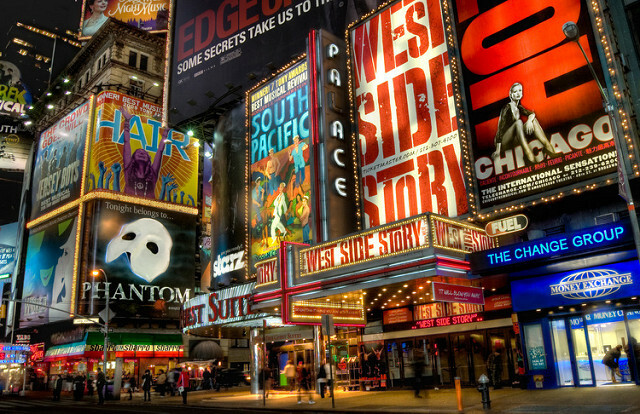 “On Broadway…On Broadway…” Amidst the cling and clatter of Times Square are some of New York’s most prized theatres, home to Tony-winning musicals that bring in millions of dollars in ticket sales each week. A Times Square-themed party has an obvious soundtrack: Broadway. Whether your crowd prefers Hamilton or Hello Dolly, the good thing about musical numbers is there’s likely a storyline fitting for whatever you’re commemorating. New York City: one of the world’s greatest dining destinations. Right? Right. Except in Times Square. Here, you’re more likely to find a chain typically found in a suburban strip mall than anything else. That, and food carts. Get creative with your catering, and feature a few different food carts for the evening. 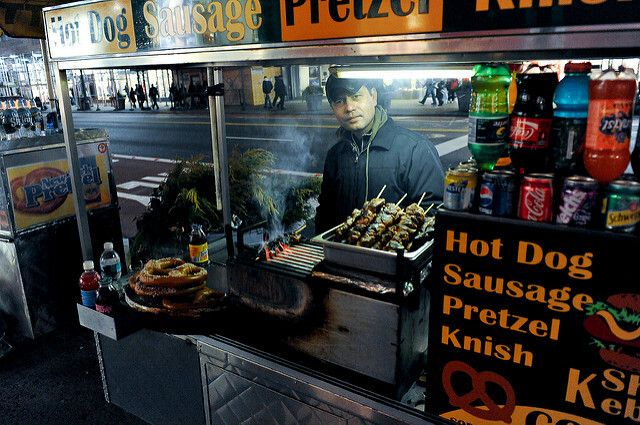 Toasted nuts, hot dogs, and bagels will certainly be on-theme, but to please your crowd you’ll likely need to reject the norms of Times Square. 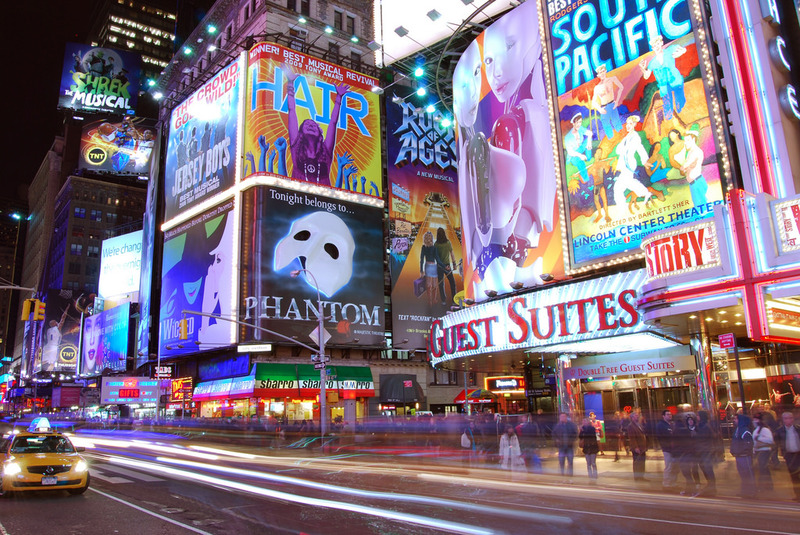 The streets of Times Square are bustling with activity, and most of it is yellow. Taxis are everywhere, traveling above the very ground where subways race below. If you’re shuttling guests from one location to another, a fleet of yellow taxis, while less cost-effective than a large charter, will set the mood. If that’s not realistic, create a replica subway car for an activity or mingling spot.